Tropical rain forests, dry deserts and mountainous vistas: Africa is home to all of these very different ecosystems and more. Its varied ecosystems provide a habitat for numerous species, and the continent harbours a great richness of biodiversity. But within species, there is another level of biodiversity: genetic variation. Even within species, there are wildly different populations. These are studied in the growing field of phylogeography. This science explores the distribution of genetic diversity, or the extent of different genetic lineages, in the context of geography. The formation of mountain ranges or islands, or the extension of rivers or forests, all influence the distribution of species: from trees, to tiny flying insects – to top predators like the lion. Understanding species at this level is vitally important in the fight against extinction. Genetic diversity includes the evolutionary potential, referring to the genetic blue print that allows a species to adjust to a changing environment. If genetic diversity is lost, for example, when unique genetic lineages go extinct, it means that the species loses part of its adaptability. This makes species more vulnerable to extinction. Earlier research has shown that lions in west and central Africa deviate from their counterparts in east and southern Africa. This, despite the fact that all African lions are considered to belong to a single subspecies. 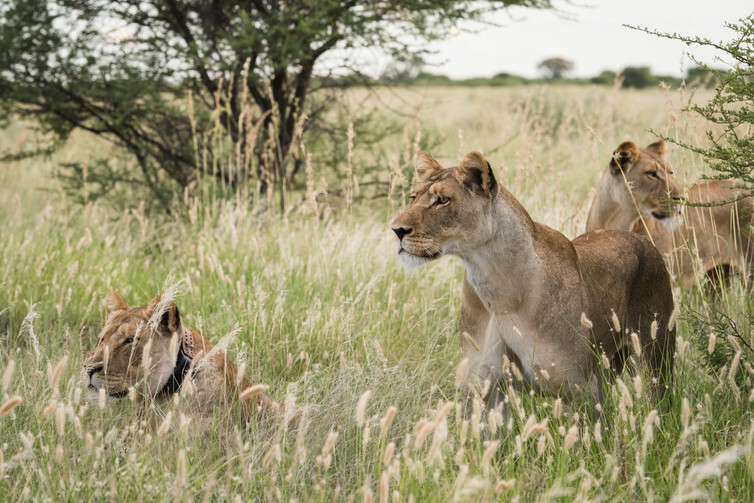 In a new publication, a new magnitude of data was gathered analysing lion populations from 22 countries. This data set includes samples from each confirmed lion population in west and central Africa. This region is particularly important because lions and other wildlife are declining. As a result, it is a major concern for conservation projects. A northern group, containing lions from west Africa, central Africa and the Asiatic subspecies. A southern group, containing lions from north east Africa, east/southern Africa and south west Africa. Based on genetic data it was also possible to calculate the timing of this split, based on the notion that differences in the DNA accumulate over time. It was estimated that the major split may have occurred around 300,000 years ago. This estimate allows us to explore further what happened during this period which could explain the differentiation between these two groups of lions. The researchers suggest that during this period the African rain forest expanded and probably formed a barrier for lion dispersal. Cyclical expansion of rain forest on one side and dry desert on the other side may have pushed lion populations into isolated pockets of suitable habitat. And this led to the genetic differentiation we still see today. Another study, which used habitat suitability models for mammal and bird species, predicted six regions that maintained a suitable habitat during historic periods of climate change. These six regions correspond directly with the six genetic lineages found in the lion. This suggests that the high resolution phylogeographic pattern found in the lion is illustrative for a range of species. Since these climatic changes didn’t just act on the lion. A large variety of species like giraffe, buffalo, cheetah and spotted hyena were also affected. The recent publication used the case of the lion to compare it to available data sets of other Savannah mammals. It showed that a large number of species have a similar pattern in which populations from west and central Africa deviated from populations in east and southern Africa. This is an important finding because it shows that we will lose important and unique biodiversity if we fail to preserve the populations in this region. In July a delegation of the west and central African lion conservation network, ROCAL, travelled to Botswana to explore opportunities for collaboration. There are large differences between parts of west/central Africa and parts of east/southern Africa in terms of ecology, politics and their socioeconomic situations. These differences present many challenges. But they are also a source of opportunities for west and central African countries to market their unique situation, both in terms of natural and cultural diversity. In addition, during the IUCN World Conservation Congress in September 2016, a delegation of researchers who were also involved in the publication will propose to set up a Species Action Partnership for west and central Africa. The hope is that this will facilitate coordination and funding of projects in the region. Phylogeographic data sets show why it’s necessary to move beyond the idea merely of preserving a species. Genetic data can be used to develop a conservation plan that incorporates the full scope of biodiversity. Failure to do so could see the African continent lose a unique part of its richness in the next few decades.